Accurate, on time VAT returns with Worcestershire Xero specialists Number 10 Accounting. We can ensure that your VAT returns are accurate and submitted on time, every time. We don’t just handle your VAT returns for you. We keep your books up-to-date so you can always see how much is owing, when it has to be paid – and that you have the funds to cover it. 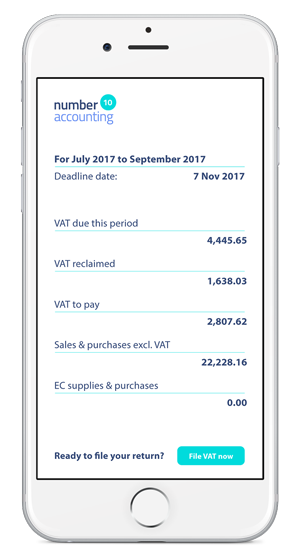 Ask us about ‘VAT snapshots’ and sending invoices and receipts via your mobile phone. If you've left your VAT return until the last minute, don't worry. Number 10 can help you get up to date and back on track. We have a policy not to leave submissions until the last minute. With real time bookkeeping, submission deadlines should never be an issue.